Standing in front of a sea of black and white, with a giant disco ball shimmering above, James Murphy stops and waits. He can’t help but laugh a bit to himself. “I only get to pause an interminable amount once more. This is my last endless pause,” he says. People reluctantly cheer; they’re sad it’s his last one but glad they’re there to witness it. 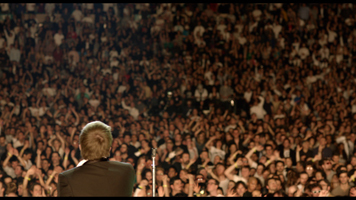 LCD Soundsystem played their last show on April 2nd of last year, and frontman James Murphy made his last interminable pause during their last song, the elegiac “New York I Love You, But You’re Bringing Me Down.” Co-directors Will Lovelace and Dylan Southern chronicle this final show in their documentary Shut Up and Play the Hits, as well as the days leading up to it and its muted aftermath. And despite the grandiosity of the moment, the epic finality of a band announcing their end and throwing “the best funeral ever” at Madison Square Garden, at its core sits a middle-aged man, Murphy, self-consciously looking back at his band, career, and legacy, wondering what happens next. That question is always latent, never explicitly asked. It’s more than enough to live through these momentous few days. Lovelace and Southern watch Murphy make coffee, sleep on the subway and walk his dog, but also bring thousands of people to their feet. Yet, somehow, he does all of this with the same open, easygoing attitude. Murphy’s relatively ordinary appearance, his straightforward onstage presence, his candid, matter-of-fact singing style all help mold his everyman lead singer persona, his wholly accessible identity as a rock star. In the last decade, Murphy has brought rock stardom to its logical, perhaps final, conclusion: You. 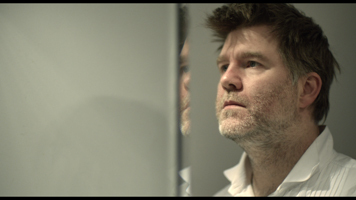 From its inception, LCD Soundsystem has been about inclusion. Their breakout track, “Losing My Edge,” lambasts hipster coolness but does so in a way that invites everyone to take part, namely, the people Murphy is talking about (who else could the song be for?). Shut Up shows Murphy and his band in this same light, whether it’s on the stage coaxing each other and the audience to make it a party or the more intimate moments where it’s just Murphy chatting someone up or struggling to put on his pajama bottoms. The interplay between the two—public/private, communal/individual—reinforces the illusion that Murphy is just like anyone else, when, of course, he isn’t. He’s LCD Soundsystem. That’s the embedded contradiction, he is us and he isn’t, simultaneously, always. All of this gleeful mayhem is anchored by a sit-down interview, one that almost becomes a sort of narration, Murphy’s super self-aware commentary on his need to “leave a stain.” The issue of pretentiousness, his origins in Louisville, making his final show a “high school dance,” the interviewer covers a lot of ground, and Murphy is more than obliging, writing his own obituary before the funeral. He explains that Nick Cave was the last rock figure to achieve a mythic status, that the very possibility of this is now extinct. On multiple occasions he mentions Lou Reed and David Bowie, describing them as demi-gods, as an unattainable level of cool. The unsaid coda here is where he fits into this conversation. What Murphy fails to say, but has never stopped saying in his music, is that LCD Soundsystem does reach the level of myth but does so in an ironic, hyper-self-conscious way—which is precisely why it works. Late in the interview Murphy confesses that this self-consciousness might be one of the band’s biggest flaws. The only one that’s bigger: stopping. The interview, the time alone, the casual backstage antics, the show, it’s all part of Murphy’s farewell, and each section builds on the others. Lovelace and Southern have given a tribute to LCD’s fans, and a primer for those new to the music. If Murphy and Co. do in fact retire—and let’s hope they MJ/Jay-Z it—then Shut Up stands as a testament to a group going out on top, by choice, together. During the interview, Murphy says that he’s trying to share an “underlying loneliness” that’s “really real,” that he is “explaining why… explaining the position… from a place… from a moment.” As he finishes “New York I Love You,” the room illuminated by thousands of cell phones acting as lighters/cameras, white balloons begin to fall from the rafters. LCD Soundsystem has turned MSG into their parents’ basement. And in that moment, no one in that room is lonely.